I mentioned in a previous post a ringed Mediterranean Gull that we had seen in the car park at the RSPB Radipole Lake reserve back in October. I sent the details (White 3J76) off to the ringing team and have just received the birds life history. Much like the last record I sent off from a Gower bird, this individual has been returning to the same place in the UK for the last couple of years. 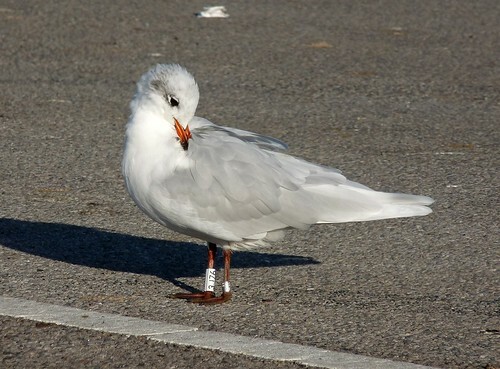 Amazingly it was originally ringed in Antwerpen Belgium as was the Gower bird. For some reason though it clearly decided it fancied the weather of Southern England instead of Wales. I can't imagine why. White 3J76 v 26/08/2008 Poole Harbour, Dorset, GB 50,4N 2W Wolf, Pim A. White 3J76 v 25/11/2009 Radipole Lake, Weymouth, Dorset, GB 50,37N 2,28W Chown, David J. White 3J76 v 26/11/2009 Radipole Lake, Weymouth, Dorset, GB 50,37N 2,28W Chown, David J.